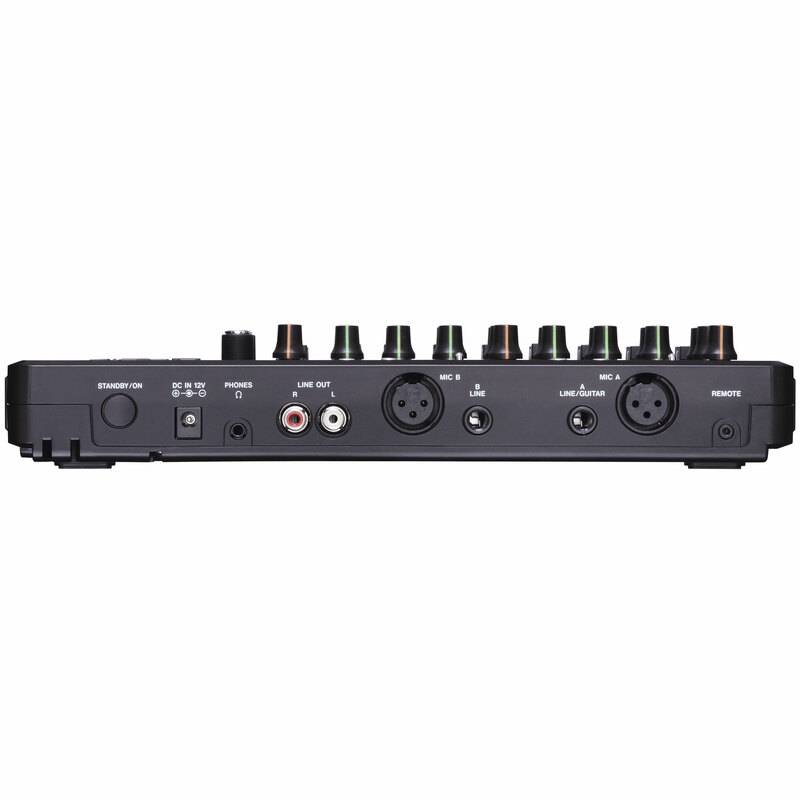 The Tascam DP-03 Digital Portastudio records two tracks at a time at CD quality to affordable SD/SDHC cards using the phantom powered XLR microphone preamps or a pair of built-in condenser microphones. The built-in condenser microphones can record mono tracks seperately or a stereo track. During recording you can manipulate reverb and the 2-band EQ using dedicated knobs for simple operation. Once recorded, tracks can be bounced, auto-punched, and edited. When production is finished, easily transfer it to your Mac or PC computer via the USB 2.0 port. Use the USB 2.0 port for audio file import and export and song backup and restore. A pair of inputs can be routed to any tracks, providing condenser microphones with phantom power when required. 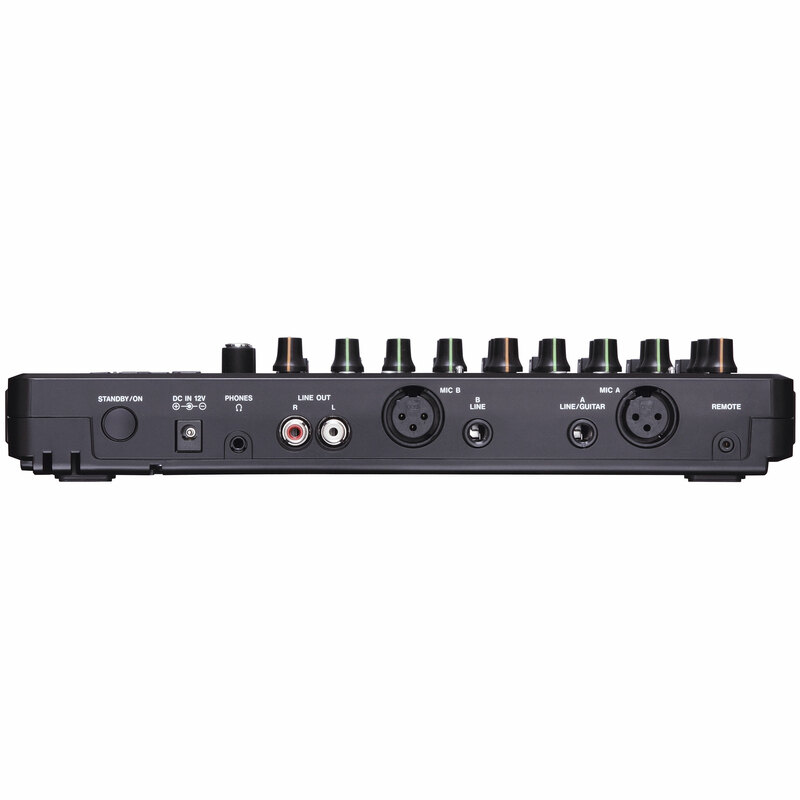 The Tascam DP-03 Digital Portastudio inputs also includes dual 1/4-inch line inputs with and switchable instrument input level on Input A for direct recording of drum machines, electric guitars, and bass without having to use a DI box. A chromatic tuner and metronome are built in for assembling polished performances. 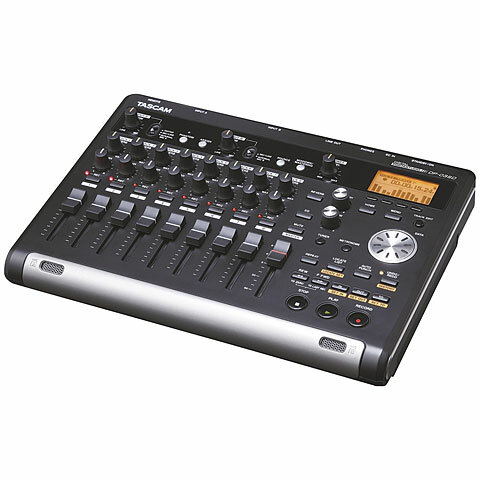 Like the Tascam DP-02, the Tascam DP-03 digital portastudio uses an array of dedicated controls for mixing, combined with a simple menu interface for editing and new mastering effects like EQ and multiband compression. During recording you can manipulate reverb and the 2-band EQ using dedicated knobs for simple operation. The Tascam DP-03 Digital Portastudio is the simplest best sounding way to share your music. The Tascam DP03 ships with Tascam PS-1225L AC adapter, 2GB SD card installed in the DP-03, and owners manual. Recording Media: SD card 512 MB - 2 GB or SDHC card 4 GB - 32 GB. File System: MTR partition Tascam original, FAT32. Built-In Microphones: 2 x omni-directional. Input A: XLR balanced, 1.4-inch balanced phone jack switchable to Guitar. Input B: XLR balanced, 1/4-inch balanced phone jack. Phone Output: 1/8-inch stereo mini jack 40 mW + 40 mW into 32 ohm load. USB: USB 2.0 Mini-B connector. Dimensions: 11.4"W x 2.1"H x 8.2"D.
Records to SD and SDHC Card media up to 32GB capactiy. CD quality 16-bit 44.1 kHz WAV audio file format. WAV files and backed-up songs on the FAT partition of the SD card can be moved and copied to a computer connected by USB 2.0. Import audio tracks from CD and USB. Built-in stereo condenser microphone can record mono tracks separately or as a stereo track. Two XLR microphone inputs with phantom power for condenser microphones. Switchable instrument-level input for guitar / bass direct recording on Input A. Nine 45-mm faders include eight track faders and one master level fader. Each track has independent Reverb and Pan adjustments and track selection buttons, volume faders and track select REC buttons. Independent 2-band EQs can be used on each input and playback track. Internal reverb processor with dedicated send per track. Reverb effect can be adjusted independently for each playback track. 128 x 64 pixel backlit graphic display. Automatic punch in and out. Track editing, autopunch and bounce features. Track editing functions include Copy, Move, Open, Cut, Silence, Clone and Clean Out. Bounce all eight tracks down to one or two tracks. Optional RC-3F footswitch offers three switches for punch-in and transport operation. Ships with 2GB SDHC media card. Dimensions: 11.4" W x 2.1" H x 8.2" D.
Windows XP, Windows Vista, Windows 7, Pentium 300 MHz or faster, 128 MB or more memory,k USB port. Macintosh Mac OS X 10.2 or later, Power PC, iMac, G3, G4 266MHz or fater, 64 MB or more memory,k USB port.